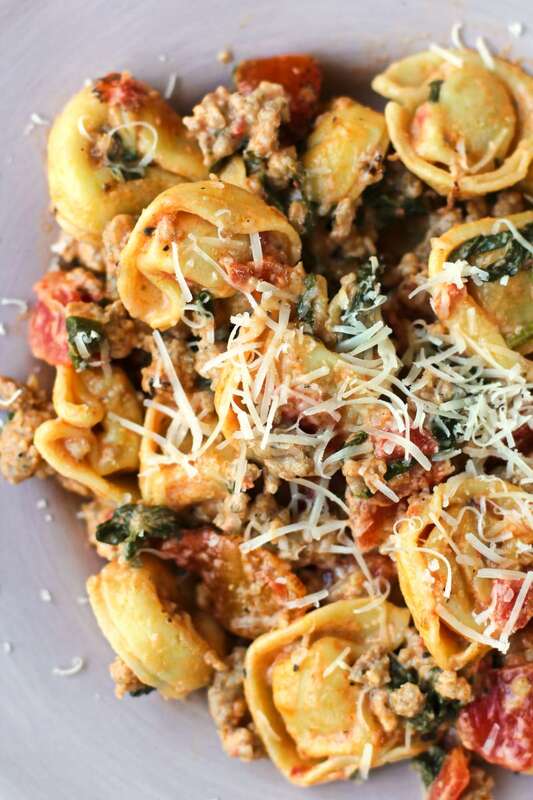 This Creamy Tomato Tortellini Skillet made with frozen tortellini is a quick and easy weeknight dinner that the whole family will love! I think we should have a talk about how amazing frozen tortellini is. Now, I'm a big fan of making things from scratch. I regularly strive to lean more towards the homemade side of things than the processed crap side. 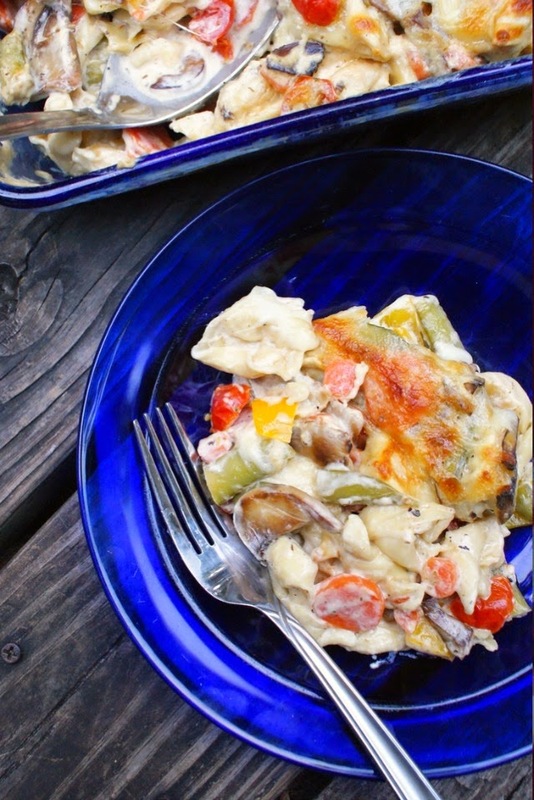 There are a few foods in my cooking arsenal that are straight out of a bag or a box, though, and tortellini just so happens to be one of them. 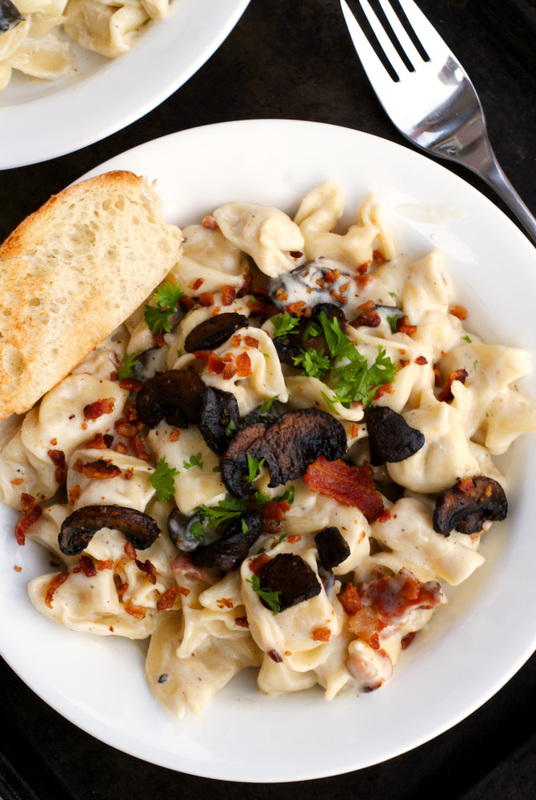 Reason #1 why I love frozen tortellini: It cooks so darn fast. A 3-minute boil and it's ready to go. When you are a parent trying to get rambunctious children in bed at a decent hour at night, every minute counts once the sun starts to set. A short cook time is for sure a plus. 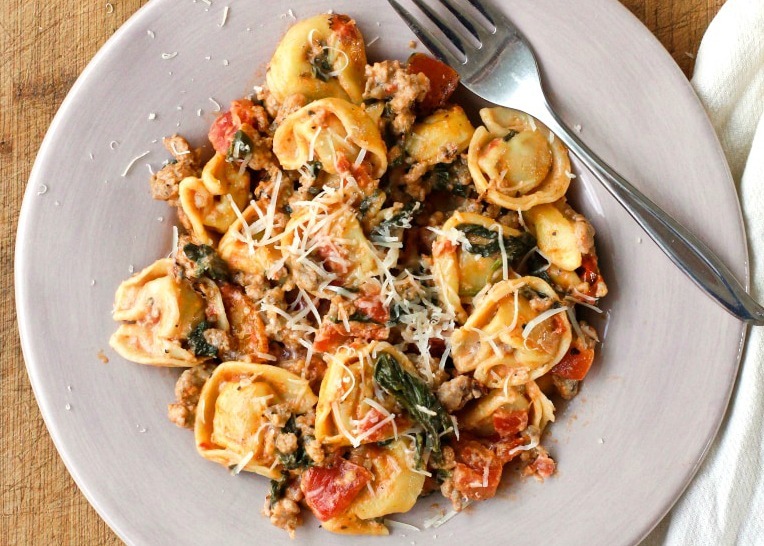 Reason #2: Tortellini is like an instant pasta upgrade. Now, I will not discriminate against any unstuffed pasta, but if you sub plain old noodles for tortellini in a recipe, you have automatically given yourself a boost in the fancy schmancy department. This doesn't go for skillet dinners, either. 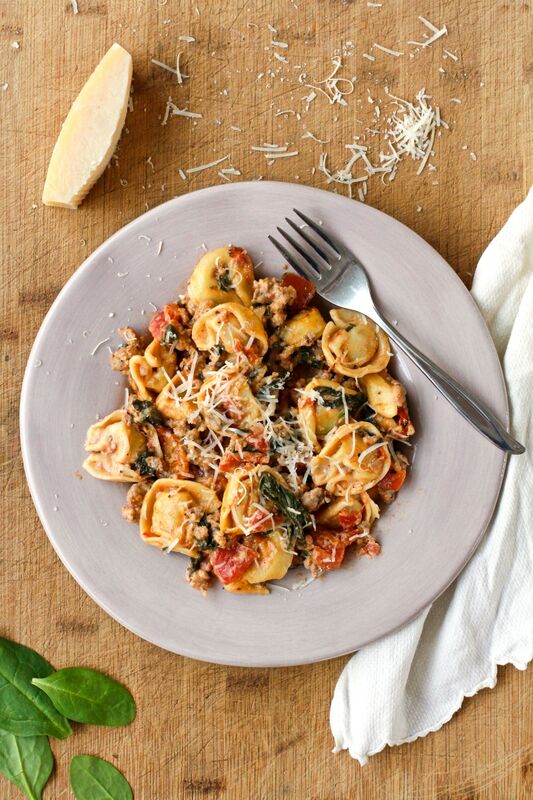 Sub tortellini for regular pasta in soups, pasta salads, and anywhere else you find regular pasta, too, and you'll see just how fabulous it is. Instant upgrade. 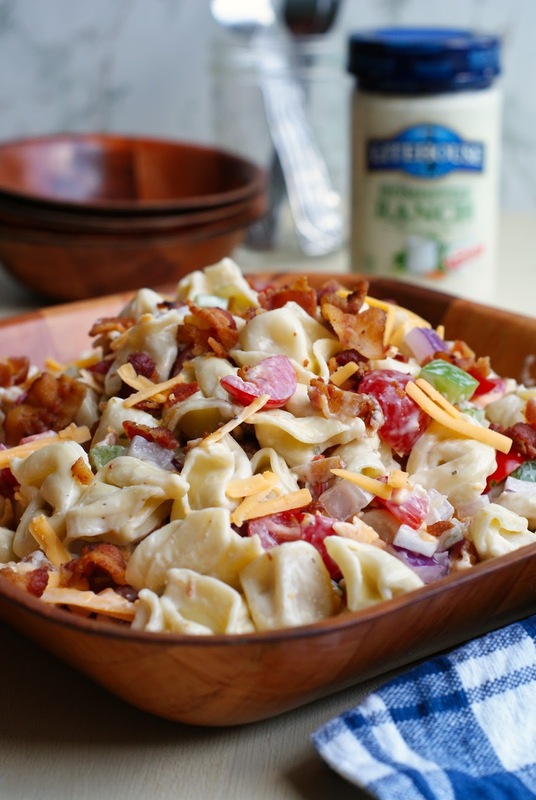 I could go on and on listing all of the reasons why tortellini is fabulous, but I'll spare you the listicle and simple tell you this: Frozen tortellini is legit the bee knees! I am happy to report that my whole family loved this dish, even the picky 6-year old who came to the table complaining that he hated what was on his plate. "I hate this" quickly turned into, "Well, it looks disgusting, but smells good." Then, after a short explanation of what each component was, ("See it's sausage, you love sausage, remember? And that's tomatoes. Just like on spaghetti and pizza! And the pasta is filled with cheese. You love cheese, too!) my little guy scarfed down his entire plate. We briefly touched on the spinach and I explained that it really tasted like nothing at all and he agreed. Mom win! I know you guys are going to love this quick, easy recipe! It's such a delish departure from your usual spaghetti night menu and you'll want to make it again and again. If you decide to try it, I'd love to know what you think in the comments below. Enjoy! 1. Cook the tortellini according to the package directions. 2. In a large skillet, brown the sausage over medium-high heat. Drain off the grease. 3. Add the tomatoes, chicken broth, Italian seasoning, garlic powder, and spinach to the skillet. Cook, stirring occasionally until the spinach has wilted. Add the parmesan cheese and cream cheese to the skillet and stir until combined. Reduce heat to medium and simmer until sauce has slightly thickened. 4. Add the cooked tortellini to the skillet. Serve with additional parmesan cheese, if desired. For a flavor twist, try subbing regular sausage with Italian sausage or spicy sausage.